On March 20, the Supreme Court will hear oral arguments in National Institute of Family and Life Advocates (NIFLA) v. Becerra. This case concerns a California law requiring unlicensed pregnancy clinics to disclose their lack of medical services and licensed pregnancy clinics to post a notice about low-cost or free reproductive health services offered by the state. Some media outlets have pushed the myth that the law compels anti-abortion fake health clinics to promote pro-choice views, including by advertising for abortions. 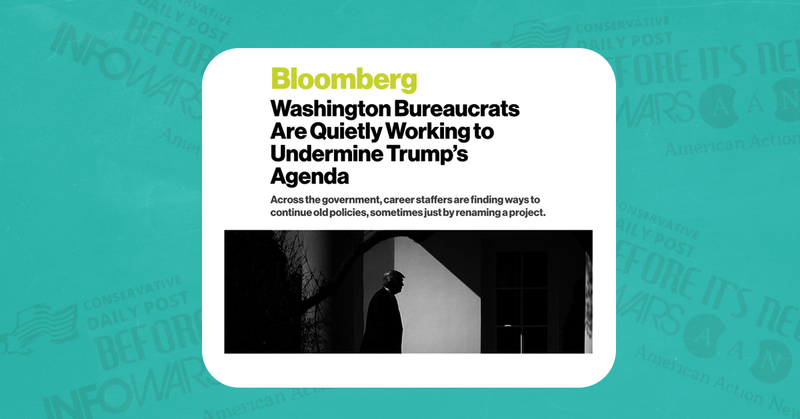 A Bloomberg article unfairly portrayed government employees who are producing accurate climate change reports as "quietly working to undermine Trump's agenda." Conspiracy theorists and right-wing media figures quickly pounced on the article as evidence for their paranoid "deep state" theories. In report after report following Donald Trump’s election, career staffers at the National Oceanic and Atmospheric Administration [NOAA] kept saying the same thing: climate change is real, serious and man-made. That’s surprising because Trump has called global warming a hoax. His political appointees at the Commerce Department, which oversees NOAA, have complained to its staff, but stopped short of demanding changes or altering the findings. So the reports, blog posts and public updates kept flowing. The bureaucrats won. As the case of NOAA illustrates, the most radical example of bureaucratic resistance may also be the simplest: continuing to issue information or reports that are factually accurate, even when they clash with the administration’s policies. Issuing factually accurate information to the public should not be characterized as "radical." It should be characterized as people doing their jobs correctly. The article also highlights activities by employees at agencies like the State Department and the General Services Administration (GSA), some of whom seem to be trying to make their Obama-era projects align better with Trump-era priorities. The GSA, for example, is now promoting its initiative to buy electric vehicles on economic grounds rather than environmental ones. This, though, is hardly nefarious stuff. But while the Bloomberg article doesn't offer much evidence to support its thesis of federal employees mounting "radical … resistance" to Trump, its framing has been enough to get right-wingers and conspiracy theorists excited. They're claiming it supports their belief that career government employees are secretly sabotaging President Trump. The Conservative Daily Post and Before It's News, both of which are known to be fake-news purveyors, wrote up the Bloomberg article on their websites. Drudge Report, the conservative blog Instapundit, and the far-right site American Action News are promoting it too. Within the Bloomberg news organization itself, there seems to be disagreement about whether or not the article supports "deep state" theories. When the reporting of basic scientific facts is considered radical and political, then we're in trouble. The magazine Scientific American warned about the politicization of science in an editorial published during the 2016 presidential campaign: "A respect for evidence is not just a part of the national character. It goes to the heart of the country's particular brand of democratic government. When the founding fathers, including Benjamin Franklin, scientist and inventor, wrote arguably the most important line in the Declaration of Independence—'We hold these truths to be self-evident'—they were asserting the fledgling nation's grounding in the primacy of reason based on evidence." Journalists, of all people, should hold fast to the idea that reporting facts is not an extreme or ideological act. It's simply a necessary one.